What if we had a tradition of remembering those who fought in the war by sharing reminiscences over their favorite treats? The beginning of May is a much-anticipated time in Russia known as the May holidays. There are two long weekends in a row, and many people take the few days in the middle off to make almost a two-week break. May 1 is Labor Day, which these days involves the labor of opening beer bottles and grilling kebabs in parks, but not much more. May 9 is a much more important date – Victory Day, the day Russia marks the end of World War II. This day is celebrated on a grand scale – there are parades and concerts on Red Square and at Victory Park. As for regular people, they get together, cook up a feast, raise their glasses to the victory over the Nazis, and remember those who didn’t come back. In my family, Granny makes the ever-present sponge cake and we remember her father, who went missing in 1941, and her husband, who served and came home. He passed away 16 years ago. Neither of them were forced to join the army: my great-grandfather worked at a factory where all employees were exempt and my grandfather was too young, but he forged the birth date in his passport so he could join the fight. In 1941, Granny was 9. Her father went missing just 3 months after leaving home. His name is on a stone memorial outside the factory he left to go war – along with the names of 1,000 others, of whom only 1 or 2 came back. Mun’ka, my great grandmother, fought to have his name put on that memorial stone, along with about 20 others there. The names of most employees who went to war voluntarily are absent. After they had been evacuated from the city and were living in the village, Granny and Mun’ka would make sponge cake and send it to the soldiers based nearby. 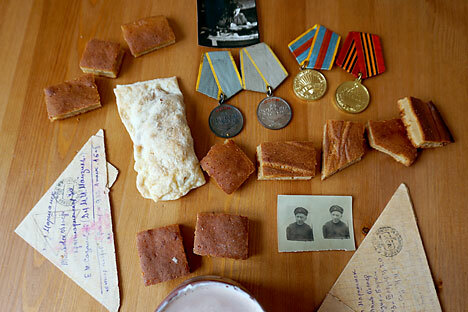 In honor and memory of those times, I made sponge cake slice today along with apple puffs and cocoa for a kind of Victory Day memorial tea. Talking to granny about the way May 9 is celebrated today, I was surprised to find out that in the times of Stalin and Brezhnev, it wasn’t celebrated as Victory Day in any official capacity — it was just the day of remembrance. I told her about my experience of going to the dawn service that Australia and New Zealand have to remember their soldiers, and was kind enough to share my Anzac biscuit, too. I find the concept of remembering rather than celebrating much more appropriate. We don’t have particular dishes that should be cooked on May 9, and I don’t know what the rules are about grandchildren setting up traditions, but it might be nice to have sponge slice with cocoa and apple puffs – something sweet to remember the loved ones, and all the other soldiers. After all, my grandfather loved sweet semolina porridge with cherries. I think he’d approve. Sift the flour. Take half it, combine it with the butter then roll it out to a thickness of 1 ½ - 2 cm. Put in a cool place. Take the remaining flour and combine with ½ cup water, lemon juice and salt. Knead the dough, roll it into a ball and let rest 20-30 minutes. Then, roll this dough out to a layer twice as wide and slightly longer than the first piece of dough (see figures on p. 266-267). Put the first piece of dough into the middle of the second piece of dough. Fold the bigger piece of dough around the smaller one to make a kind of envelope. Sprinkle a table with flour and roll out the dough to about a thickness of 1 cm. Let rest in a cool place for 30-40 minutes. Cut into strips 7-8 cm wide and brush with beaten egg. Put on a baking sheet. Bake for 20-25 minutes. Pastry should be 4-5 cm thick. Wash the apples. Cut them in half and remove the cores. Rub them through a sieve. Put puree into a saucepan and add sugar. Stir. Put on the stove and cook until thick (5-10 minutes) stirring frequently. Then, put the pastry strips on a cutting board and cut them in half length-wise. On the lower crust, put the apple filling. Put the top crust on. Cut into individual-sized pastries, sprinkle with powdered sugar and serve. Separate the eggs. Whip the egg whites into a foam. Combine sugar and egg yolks. Mix well. Add vanilla. Add sour cream. Stir. Add flour and egg whites. Stir. Pour the batter into a greased dish and put in a cool (low temperature) oven for 20-25 minutes.